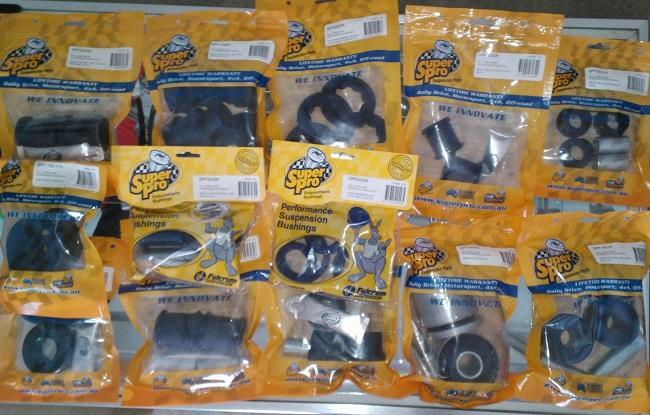 Introducing the ONLY complete bushing kit for the 1993-98 Supra from SuperPro! Suspension bushings deteriorate over time, it’s an unfortunate service that any car will have to have as the years pass. MVP has compiled EVERY bushing that is offered for the MKIV Supra in one easy to purchase kit to same you time and hassle! On top of that, SuperPro Bushings are covered by a LIFETIME Warranty. Should any of these bushings ever fail, they will be replaced free of charge without exception!! If you wish to save a little money on your bushings ask about substituting R2 Racing Control Arm Bushing Kits in place of the SuperPro counterparts! Any part of this kit can be purchased individually, simply call or email for individual item pricing. SPECIFY YEAR IN YOUR SHIPPING NOTES. ALSO MUST CONFIRM IF YOUR FRONT UPPER-INNER CONTROL ARM BUSHING HAS A 20MM WIDE HOUSING OR 38MM WIDE HOUSING!